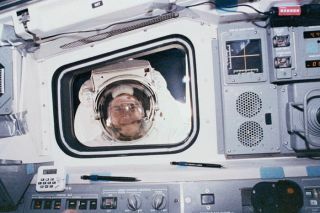 Astronaut Rick Hieb looks into the space deck during an STS-49 EVA in May of 1992. In this historical photo from the U.S. space agency, Rick Hieb, a Mission Specialist aboard STS-49, looks into the aft flight deck of the orbiter during his spacewalk. STS-49, which launched on May 7, 1992 and returned to Earth on May 16, 1992, marked the first flight of Endeavour and the first shuttle mission to feature four EVAs. Hieb, along with fellow astronauts Pierre Thuot and Thomas Akers helped to recover INTELSAT VI, a communications satellite whose orbit had become unstable.